Commentary on Billing Systems, Accounting Software and Cloud Computing. New business models appear as the technology landscape evolves. Most of the sales and service companies within the ICT sector have now evolved into service re-sellers, or service aggregators. This is a direct result of the Internet and Cloud computing. Businesses today have access to a huge range of cost-effective, scale-able, public-cloud computing and communication resources, available on subscription or usage-based pricing plans that can scale along with business growth and demand. “Everything as a Service”. What do businesses need to make productive use of all this readily available ICT resource? Most businesses need external expertise and support to provide a service layer over the top of these on-line resources to produce functional business solutions that perform correctly for the business’ requirements. This service layer of expertise and support is typically provided by Managed Service Providers (MSPs) and in some cases, Value-Added Re-sellers (VARs) that focus on particular business applications, such as ERP or accounting software, CRM solutions, communications, inventory or production solutions. MSPs and VARs typically have a good understanding of their customers’ business models, workflows and processes. They are able to recommend, advise on, design and sell business solutions to suit the customer’s business requirements. These solutions are often hybrid, meaning that some parts of the solution might be their own services, while other parts may be on-line services wholesaled by other suppliers. Convergence of IT and communications (computers and phones have merged) means that IT-focused MSPs are now being looked upon to provide voice solutions, such as VoIP, virtual PBX and mobile along with data and connectivity services. We are even seeing electricity sales converging with telephony, to add to the mix. Businesses customers are showing a clear preference for simplicity and buying their ICT and on-line services from a single supplier, who can be held accountable for their entire technology framework, including voice and data connectivity – maybe even electricity as well. What is the biggest challenge for MSPs re-selling services and hybrid solutions? The biggest challenge of the Service Re-seller is to combine a collection of services from any number of suppliers (both internal and external) and then bundle, price and present it all to the customer in the most simple and easily understandable form – a single bill. This is no easy task because often the services involved have a different pricing basis, different display requirements, different suppliers and may need to all be bundled together on the same invoice. Billing of voice and mobile services is already complex, let alone when it is combined or bundled with other types of services. What solutions are available to help service re-sellers manage the complexity of combining multiple services? A new generation of Cloud-based billing solutions, such as Datagate, is designed to simplify and automate the job of combining, rating and billing different types of services from any number of suppliers. Datagate will also present usage data and invoices to end-customers via a white-label, end-user portal. It also integrates with most common accounting or ERP systems, such as Xero, Quickbooks, MYOB, SAP, Sage, Microsoft and others, meaning invoices get passed through to the re-seller’s accounting system, without the need for any re-keying. Worldwide, across so many industry sectors, there is a growing trend towards subscribing to services and paying based on usage of those services. This behavior is being driven by the dominance of the Internet (or Cloud), which itself has a predominantly service-based business model. Service re-sellers are the way of the future! “It’s not what you know, it’s who you know” is a well known statement that I partly agree with. It implies that powerful business networks are all that matters, but I would argue that you also need a good reputation and a strong value proposition to go with it. Can you imagine how hard it would be to be successful in business with a strong network but a bad reputation? The strong network would certainly ensure that nobody would do business with you. Building your business network and building your reputation go hand in hand. You must invest in both throughout your career. Doing this will make your business career easier and more rewarding as time goes on. I am very fortunate to have worked for the last 30 years within the same closely connected industry sectors and have built up networks throughout New Zealand, Australia, USA, Canada and other countries. I consider my participation and membership of these networks to be a major asset, that I would argue is worth millions of dollars – certainly that would be the cost of rebuilding networks of that size and reach. By staying within the same industry sectors throughout my career, the networks that I have built up over time are now shared with and valuable to my company and employer, Datagate Innovation. To maintain any asset, you must continue to invest in it. Datagate and I continue to invest in our networks through participation in industry events, conferences, newsletters, Social Media and industry networking groups. This month, Datagate signed up with a New Zealand ICT networking group called AFQY (A Few Quiet Yarns). It’s leader, Ryan Ashton is a prolific networker and LinkedIn guru. AFQY has strict rules, such as “no selling allowed” and “meet as many people as you can” in place for the networking events, that are held in bars at strategic locations around the countryside. The events are great opportunities to invite people from the respective regions around New Zealand to come in, have a drink and get to meet and talk with new industry contacts. You might have noticed that my photograph appears regularly on Enprise’s web sites and marketing material. A fair question would be why me and why not a better-looking member of the Enprise team (of which there are many!). My rationale is that business is personal and as CEO I am ultimately responsible to every customer, partner, shareholder, staff member and board member for the performance and behavior of Enprise, its people, services and software products. In business, you need to know (or at least see) who you are dealing with and where the buck stops. At Enprise, it stops with me. My resolution for the New Year and beyond, is to continue striving to make Enprise a better and bigger business; to give better quality of service and offer better value for money to our customers and partners; to offer new innovative solutions to give our customers true competitive advantage; to be a great employer and attract and retain the best staff; to be fair and honest in all business dealings; to grow the business; and to give a fair and good return to our shareholders. What’s more, I’m going to put more pictures of other Enprise team members on to our web sites and promotional material – in addition to me! I think 2013 is shaping up to be a prosperous year for small to medium-sized businesses – and on that note, I’d like to wish all readers Compliments of the Season and Happy New Year! I’ve been going to a few reunions lately – maybe it’s my age. First came the school reunions, which were notable for their lack of participants; then came a couple of business reunions which were a totally different story and a lot more fun. Last Saturday night I dropped in to La Zeppa in Auckland to catch up with about 50 of my former colleagues from PC Direct. The reunion was instigated and organised by a number of the former staff, including Jennifer Stott, Eduard Johansen, Trevor Fowler and Cheryl Tinholt. 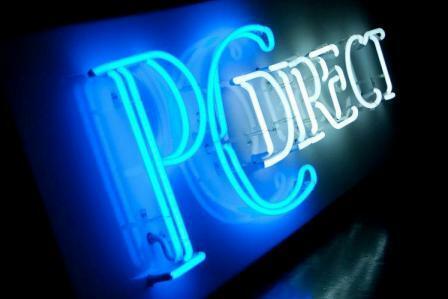 PC Direct is a New Zealand success story that started with its founders Maurice Bryham and Sharon Hunter in 1989 and grew to dominate the local personal computer market for most of the 1990’s, with a team of up to 120 staff. At times its share of the New Zealand PC market was larger than the global players such as IBM, Compaq and HP. Over 100,000 PC Direct computers were built and sold in to a market population of only 4 million people. Not bad market penetration! Accordingly, PC Direct was known as the “Mouse that Roared”. A well attended company reunion is the reflection of a great company and a great culture. Everyone was proud of being a part of it. PC Direct’s culture was electric. Its staff were young, motivated, enthusiastic and talented. We all worked hard and had fun. The business was winning on all fronts, including the marketplace, the industry awards and the minds of the computer-buying New Zealand public. The people of PC Direct are now spread throughout the New Zealand IT industry and beyond (around the world in fact). I think many of us learnt a lot from that very positive experience. I certainly did. I’m now looking forward to the 25th PC Direct anniversary reunion in a couple of years time (2014). I expect even more of the old team will attend that. Opportunities in the "Usage Economy"